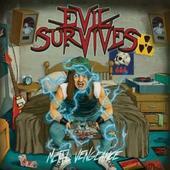 Evil Survives are heavy metal: the nasty riffs, melodic solos, running drums and a singer who belts it out in harmony with the guitar -- what else would you expect? The bass often sounds like Iron Maiden and that's no easy feat. The guitar is the real show here, quick blasts of melodic mayhem that lead into some really great solos that seem to scream forever. The vocals are a mixture of two different styles, hard rock and heavy metal. They're all right, but nothing to rave about. After a while the guitar will emerge as the chosen voice of this band and you'll be amazed at some of the updated, albeit classic, metal Evil Survives produces. The guitarist's name is Adrian Riff -- now that's a guitar player's name! These guys have been plugging in around Canada and the USA for a few years and this is their third disc. You can find out more at http://www.myspace.com/evilsurvives. Copyright © 2012 by R. Scott Bolton. All rights reserved. Revised: 15 Apr 2019 22:35:12 -0400 .